Stylish and durable, this cutting stool is the perfect solution where space may be limited. With a height range of 18.5" up to 26", this stool gives you just the right angle for precision work. As pictured only. Some assembly may be required. 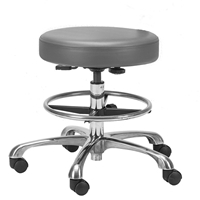 With our Pneumatic Stool with back, adjusting your height (within a range of 19" - 26") is as simple as pressing a lever, and you can do it while you're sitting. The seat is a 17” diameter, base is 21.5" diameter. Available with or without a back, in your choice of vinyl and color to match your table. Natursoft colors: Marie's Beige, Latte, Black, Mystic Blue, Amethyst, Teal, Vanilla Crème, Burgundy, Hunter. Other colors available at additional cost. Comes with foot ring, but can be removed. Black base with 5 casters. Lumbar support. Noiseless casters "Soft Wheel"
it while you're sitting. 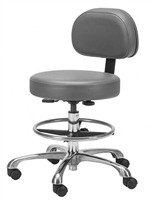 The seat is a 17” diameter, base is 21.5"
available at additional cost. Comes with foot ring, but can be removed. Ergonomical saddle seat with seamless finish. Black only. Adjusting your height (within a range of 19" - 27") is as simple as pressing a lever. Folds flat for easy carrying and storage and weighs less than 5 pounds. Lightweight yet durable, the Solutions Wooden Folding Stool features a 13" square seat with 3" of comfortable foam padding, a stable, natural hardwood base and a supple leather handle for easy transport.